As many of you know, the #4 issue of Lonny came out last weekend. The focus of the issue is designing with eco-friendly materials and how to make your home more environmentally friendly (in honor of Earth day and just trying to be more proactive in general). I just got around to reading it and was pleasantly surprised to see Laura Day on the cover and her nursery featured inside. Laura Day is a designer, mother, and webazine editor of Laura Day Living, a bi-monthly on-line magazine. The second issue just came out. My favorite part of her site is the I LOVE THESE section where she publicizes her favorite books, products, online sites, places and people. The goal of her webazine is to share her knowledge to help inspire people to find their style and to see their homes in a different light. 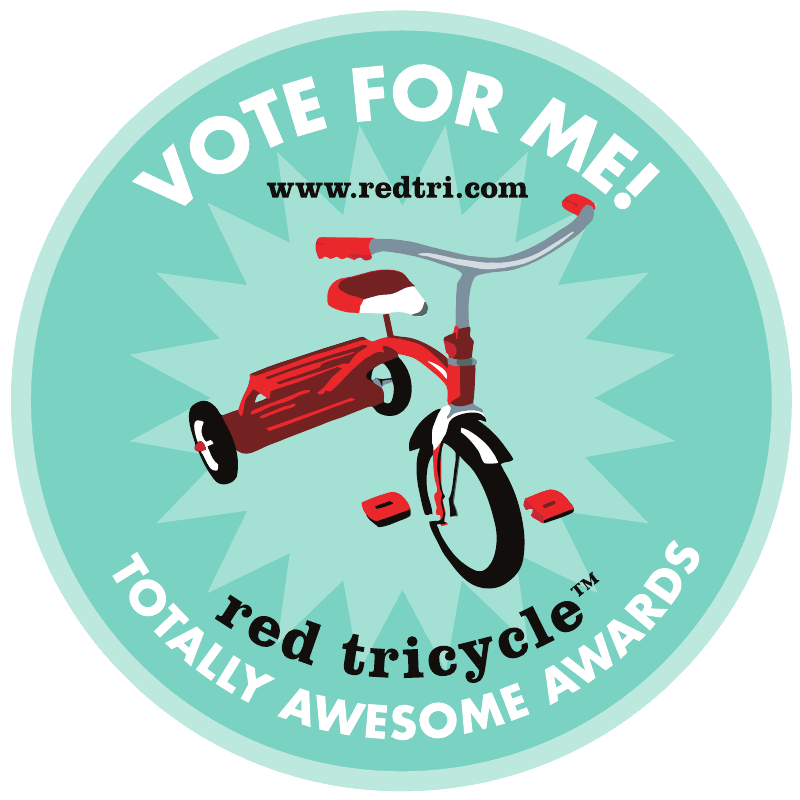 She encourages her readers to take chances in design and to not over think their choices. 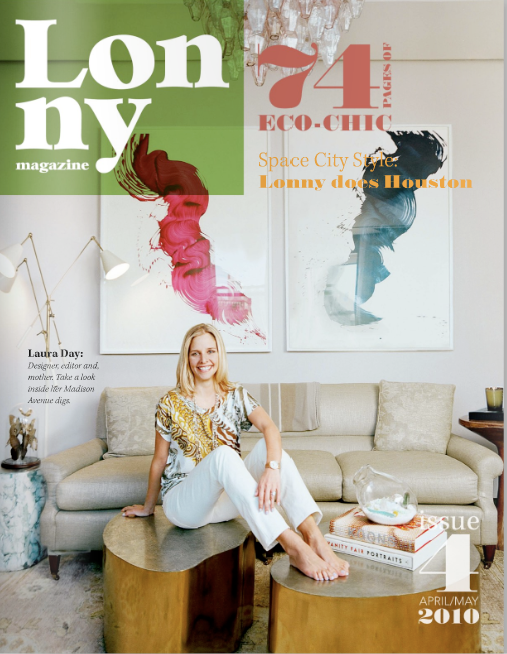 The following are photos of Laura's Manhattan home feautured in the newest issue of Lonny Magazine. This is Laura in her living room with her adorable two year old daughter Olivia. Now onto Olivia's rooms. How much fun is this oversized mirror above the Oeuf the crib? This is definitely sure to keep your little one occupied in the morning. The simplicity of the white bedding and furniture definitely create a calming sense in the bedroom. Instead Laura chooses to go bold with the pattern in the rug. 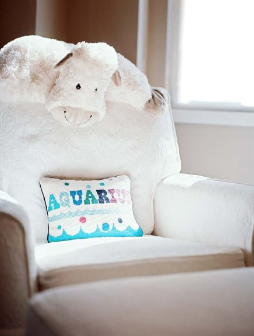 An Aquarius pillow from Jonathan Adler with a Jelly Cat truffles sheep posted on the glider. The playroom was originally intended to be an office. So with a built in memo board already installed, Laura decided to dress it up by painting the frame and created a photo collage. Again, she uses a strong rug. 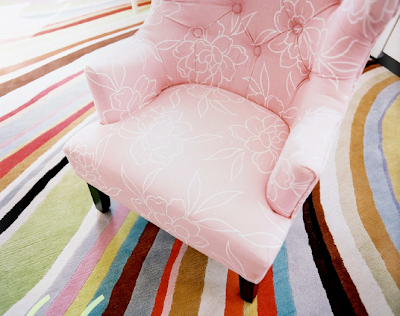 This Paul Smith rug by the Rug Company is a classic and could work well in any setting. I mean look at all the colors you have to play with. This is one lucky kid to grow up in such a fabulous house with such a talented mom. When can we come over for a play date??? Does anybody know the color of paint in the nursery with the white crib and mirror?